If you asked me where in the world I would like to visit, the Falkland Islands would not have come to mind. It turned out to be a port stop on our cruise around the southern tip of South America. 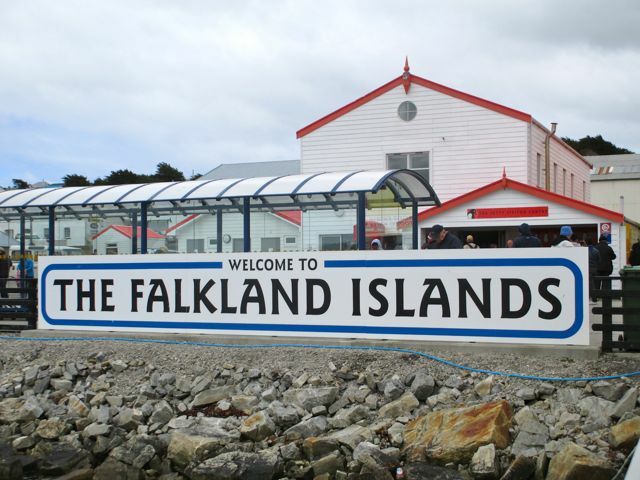 If you’re looking for a sturdy British community with penguins, look no further than the Falkland Islands. The December day we visited, technically “summer” this far south, was cool, the sky filled with puffy white clouds on a cold gray background. Temperatures in these islands off southern Argentina fluctuate little, I learned, never much below freezing or hotter than about 75 degrees Fahrenheit. Summer days are long, but sunlight is often limited by cloud cover. 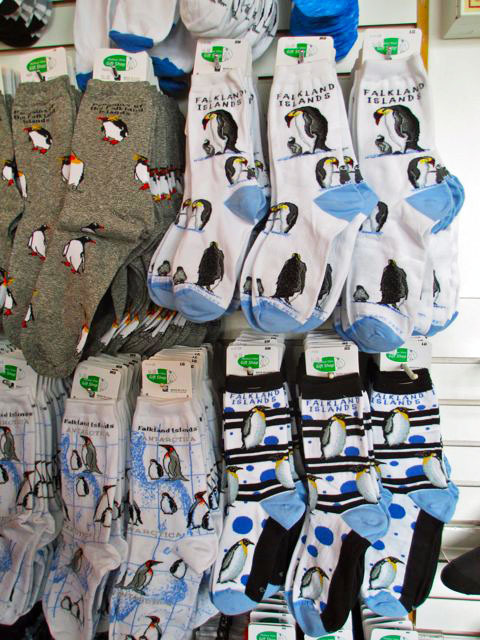 This is where you go to find everything penguin: shirts, caps, jackets, socks. This is because several million penguins breed here. Species include Rockhopper, Gentoo, Macaroni, Magellan and King penguins. 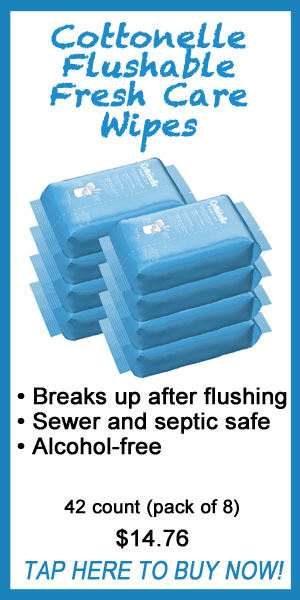 Who knew there were so many different kinds? You may remember the Falkland Islands, also known as “Malvinas Islands or Islas Malvinas” in the US news for their 1982 war with Argentina, though I have no idea why Argentina would want to claim remote islands of cliffs and rugged terrain and sheep farms and a bunch of penguins. In any case, the British again prevailed. 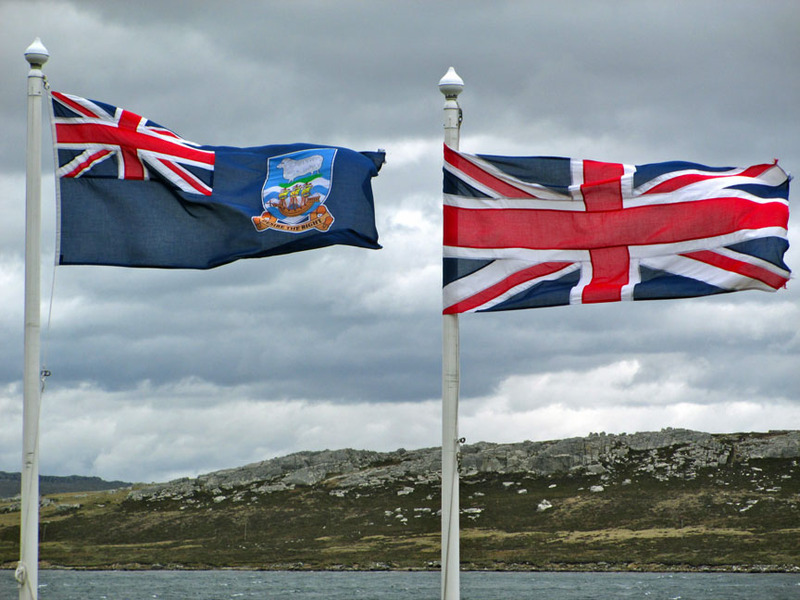 The history of the Falklands is British, having been occupied by a self-supporting British community since 1885. Argentina regularly protested Britain’s occupation of the islands, and had decades previously claimed sovereignty there, even though in 1833 their officials had been expelled from the island by the British. 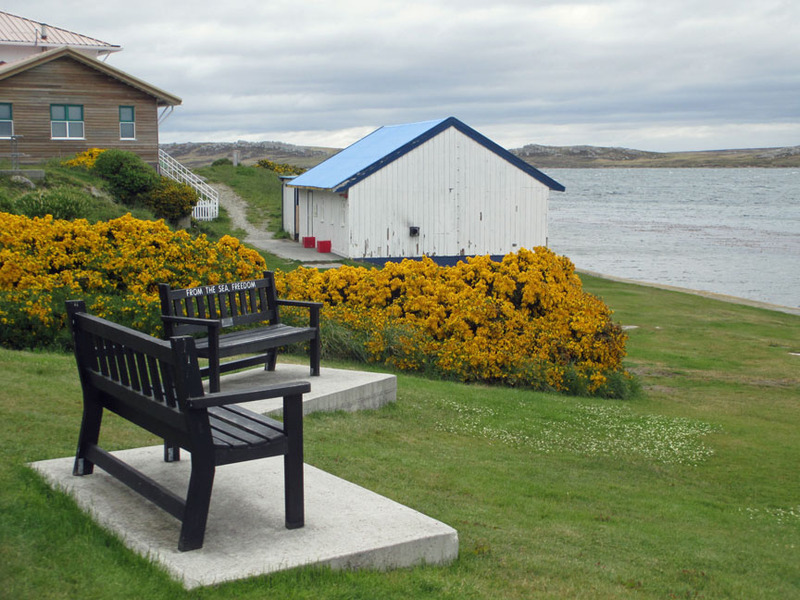 The Falklands are historically English speaking and Four-fifths of the population live in the capital of Stanley, also called Port Stanley. 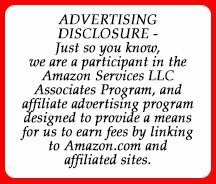 In 2013 the residents voted to remain a British overseas territory. While other passengers from our cruise ship went off to a reserve to see King Penguins, we chose to explore Stanley, with its population of less than 3,000. We found the town to be very walkable, the residents friendly. We poked into pubs and shops and the local post office and the historic Dockyard Museum. At the 4-star Malvina House Hotel we enjoyed a quiet dinner. This is one of the top hotels in Stanley, on the site of a house built by John James Felton in 1880, and overlooking the harbor. From there we walked just a few minutes to check out the big Christ Church Cathedral. The southernmost Anglican cathedral in the world, it’s constructed of local brick and stone, and dates from the 1890s. 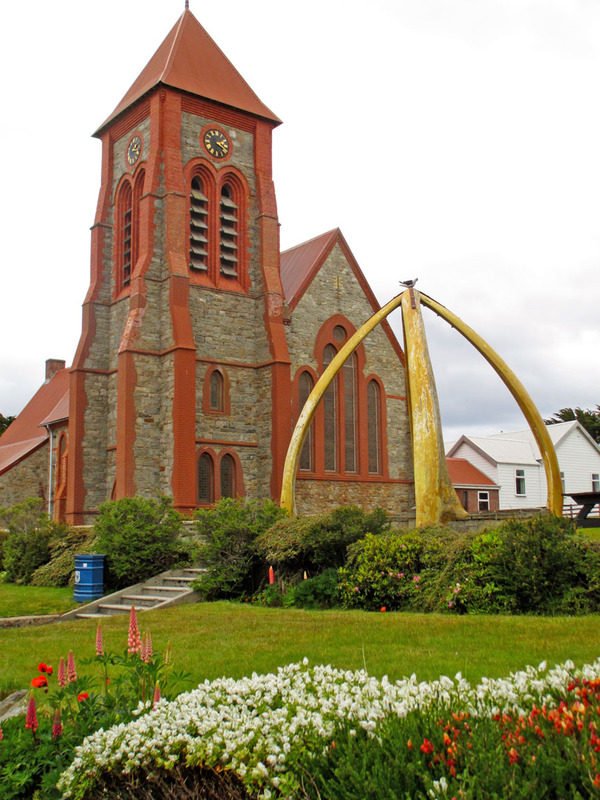 In front of the church stands a grand monument, made from the jaws of two blue whales, the Whalebone Arch. It was constructed in 1933 to commemorate one hundred years of British rule in these islands. 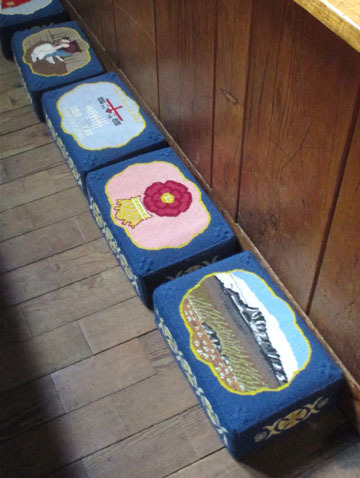 Inside the church, little square cushions, called “kneelies”, adorn a step in the front of the sanctuary, needlepointed with care by the ladies of the church. The kneelies, combined with the gray clouds that filled the sky, made me think that winters in the Falkland Islands are loooooong. 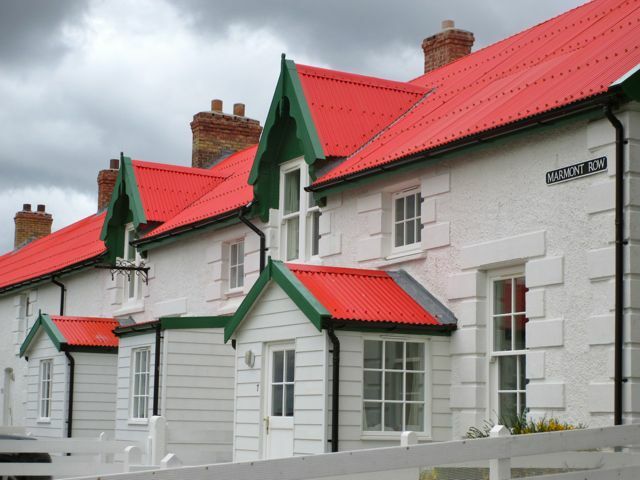 Along our walk, we passed colorful Marmot Row, a series of residential houses that were originally a late nineteenth-century hotel with cottages. 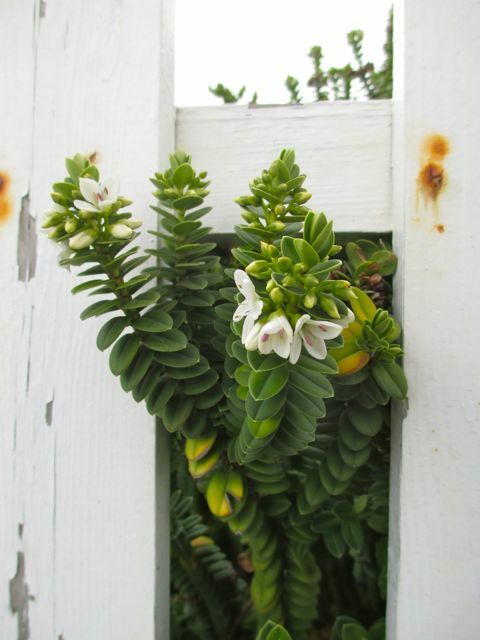 Flowers adorned the fences in front of these well-kept homes.